GEORGE 1980: "'Taxman' was when I first realized that even though we had started earning money, we were actually giving most of it away in taxes. It was and still is typical." JOHN 1980: "I remember the day he (George) called to ask for help on 'Taxman,' one of his first songs. I threw in a few one-liners to help the song along because that's what he asked for. He came to me because he couldn't go to Paul. Paul wouldn't have helped him at that period. I didn't want to do it. I just sort of bit my tongue and said OK. 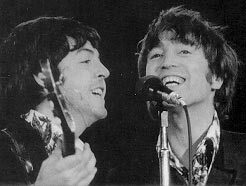 It had been John and Paul for so long, he'd been left out because he hadn't been a songwriter up until then." PAUL 1984: "George wrote that and I played guitar on it. He wrote it in anger at finding out what the taxman did. He had never known before then what could happen to your money." GEORGE 1987: "I was pleased to have Paul play that bit on 'Taxman.' If you notice, he did like a little Indian bit on it for me." PAUL 1966: "I was sitting at the piano when I thought of it. The first few bars just came to me, and I got this name in my head... Daisy Hawkins picks up the rice in the church. I don't know why. I couldn't think of much more so I put it away for a day. Then the name Father McCartney came to me, and all the lonely people. But I thought that people would think it was supposed to be about my Dad sitting knitting his socks. Dad's a happy lad. So I went through the telephone book and I got the name McKenzie. I was in Bristol when I decided Daisy Hawkins wasn't a good name. I walked 'round looking at the shops, and I saw the name Rigby. Then I took the song down to John's house in Weybridge. We sat around, laughing, got stoned and finished it off." JOHN 1980: "Paul's baby, and I helped with the education of the child... The violin backing was Paul's idea. Jane Asher had turned him on to Vivaldi, and it was very good." PAUL 1984: "I got the name Rigby from a shop in Bristol. I was wandering round Bristol one day and saw a shop called Rigby. And I think Eleanor was from Eleanor Bron, the actress we worked with in the film 'Help!' But I just liked the name. I was looking for a name that sounded natural. Eleanor Rigby sounded natural." JOHN 1980: "It's got backwards guitars... that's me dreaming my life away." PAUL circa-1994: "It was a nice idea-- 'There's nothing wrong with it. I'm not being lazy, I'm only sleeping, I'm yawning, I'm meditating, I'm having a lay-in.' The luxury of all that was what it was all about. The song was co-written but from John's original idea." GEORGE 1966: "I play sitar on another track. I don't care if everybody is using 'em, you know. I just play it 'cuz I like it." GEORGE 1980: "'Love You To' was one of the first tunes I wrote for sitar. 'Norwegian Wood was an accident as far as the sitar part was concerned, but this was the first song where I consciously tried to use the sitar and tabla on the basic track. I overdubbed the guitars and vocals later." JOHN 1972: "This was a great one of his." JOHN 1980: "That's Paul's song completely, I believe. And one of my favorite songs of the Beatles." PAUL 1984: "I wrote that by John's pool one day. When we were working together, sometimes he came in to see me. But mainly, I went out to see him." PAUL circa-1994: "'Here, There and Everywhere' has a couple of interesting structural points about it... each verse takes a word. 'Here' discusses here, Next verse, 'there' discusses there, then it pulls it all together in the last verse with 'everywhere.' ...John might have helped with a few last words." PAUL 1966: "It's a happy place, that's all. You know, it was just... We were trying to write a children's song. That was the basic idea. And there's nothing more to be read into it than there is in the lyrics of any children's song." JOHN 1972: "Paul wrote the catchy chorus. I helped with the blunderbuss bit." JOHN 1980: "'Yellow Submarine' is Paul's baby. Donovan helped with the lyrics. I helped with the lyrics too. We virtually made the track come alive in the studio, but based on Paul's inspiration. Paul's idea. Paul's title... written for Ringo." PAUL 1984: "I wrote that in bed one night. As a kid's story. And then we thought it would be good for Ringo to do." PAUL circa-1994: "I was laying in bed in the Asher's garret, and there's a nice twilight zone just as you're drifting into sleep and as you wake from it-- I always find it quite a comfortable zone. I remember thinking that a children's song would be quite a good idea... I was thinking of it as a song for Ringo, which it eventually turned out to be, so I wrote it as not too rangey in the vocal. I just made up a little tune in my head, then started making a story-- sort of an ancient mariner, telling the young kids where he'd lived. It was pretty much my song as I recall... I think John helped out. The lyrics got more and more obscure as it goes on, but the chorus, melody and verses are mine." GEORGE 1999: "Paul came up with the concept of 'Yellow Submarine.' All I know is just that every time we'd all get around the piano with guitars and start listening to it and arranging it into a record, we'd all fool about. As I said, John's doing the voice that sounds like someone talking down a tube or ship's funnel as they do in the merchant marine. (laughs) And on the final track there's actually that very small party happening! As I seem to remember, there's a few screams and what sounds like small crowd noises in the background." JOHN 1968: "That was pure. You see, when I wrote that I had the 'She said she said,' but it was just meaning nothing. It was just vaguely to do with someone who had said something like he knew what it was like to be dead, and then it was just a sound. And then I wanted a middle-eight. The beginning had been around for days and days and so I wrote the first thing that came into my head and it was 'When I was a boy,' in a different beat, but it was real because it just happened." JOHN 1980: "That's mine. It's an interesting track. The guitars are great on it. That was written after an acid trip in L.A. during a break in the Beatles tour where we were having fun with the Byrds and lots of girls. Peter Fonda came in when we were on acid and he kept coming up to me and sitting next to me and whispering, 'I know what it's like to be dead.' He was describing an acid trip he'd been on. We didn't 'want' to hear about that. We were on an acid trip and the sun was shining and the girls were dancing, and the whole thing was beautiful and Sixties, and this guy-- who I really didn't know-- he hadn't made 'Easy Rider' or anything... kept coming over, wearing shades, saying, 'I know what it's like to be dead,' and we kept leaving him because he was so boring! And I used it for the song, but I changed it to 'she' instead of 'he.' It was scary... I don't want to know what it's like to be dead!" JOHN 1972: "Paul. But I think maybe I helped him with some of the lyric." JOHN 1980: "'Good Day Sunshine' is Paul's. Maybe I threw in a line or something." PAUL 1984: "Wrote that out at John's one day... the sun was shining. Influenced by the Lovin' Spoonful." PAUL circa-1994: "'Good Day Sunshine' was me trying to write something similar to 'Daydream.' John and I wrote it together at Kenwood, but it was basically mine and he helped me with it." JOHN 1980: "Another of my throwaways." GEORGE 1987: "I think it was Paul and me, or maybe John and me, playing (guitar) in harmony-- quite a complicated little line that goes through the middle-eight." PAUL 1995: "One of my favorites on the Anthology is, 'And Your Bird Can Sing,' which is a nice song, but this take of it was one we couldn't use at the time. John and I got a fit of the giggles while we were doing the double-track. You couldn't have released it at the time. But now you can. Sounds great just hearing us lose it on a take." JOHN 1972: "Another of his I really liked." JOHN 1980: "Paul's. One of my favorites of his. A nice piece of work." PAUL 1984: "I wrote that on a skiing holiday in Switzerland. In a hired chalet amongst the snow." PAUL circa-1994: "I suspect it was about another argument. I don't have easy relationships with women, I never have. I talk too much truth." JOHN 1972: "Me. I think Paul helped with the middle." JOHN 1980: "Another of mine. Mainly about drugs and pills. It was about myself. I was the one that carried all the pills on tour... later on the roadies did it. We just kept them in our pockets, loose, in case of trouble." PAUL circa-1994: "John and I thought that was a funny idea-- the fantasy doctor who would fix you up by giving you drugs. It was a parody on that idea." GEORGE 1980: "...about the avalanche of thoughts that are so hard to write down or say or transmit." JOHN 1968: "We were doing our Tamla Motown bit. You see, we're influenced by whatever's going. Even if we're not influenced, we're all going that way at a certain time." JOHN 1972: "I think George and I helped with some of the lyrics. I'm not sure." JOHN 1980: "Paul. I think that was one of his best songs, too, because the lyrics are good and I didn't write them. You see? When I say that he could write lyrics if he took the effort-- here's an example." PAUL 1984: "That's mine-- I wrote it. It was the first one we used brass on, I think. One of the first times we used soul trumpets." PAUL circa-1994: "I'd been a rather straight working class lad, but when we started to get into pot it seemed to me to be quite uplifting. It didn't seem to have too many side effects like alcohol or some of the other stuff, like pills, which I pretty much kept off. I kind of liked marijuana and to me it seemed it was mind-expanding, literally mind-expanding. So 'Got To Get You Into My Life' is really a song about that. It's not to a person, it's actually about pot. It's saying, 'I'm going to do this. This is not a bad idea.' So it's actually an ode to pot, like someone else might write an ode to chocolate or a good claret. I haven't really changed my opinion too much, except if anyone asks me for real advice, it would be stay straight. That is actually the best way, but in a stressful world I still would say that pot was one of the best of the tranquilizing drugs. I have drunk and smoked pot and of the two I think pot is less harmful. People tend to fall asleep on it rather than go out and commit murder, so it's always seemed to me to be a rather benign one." 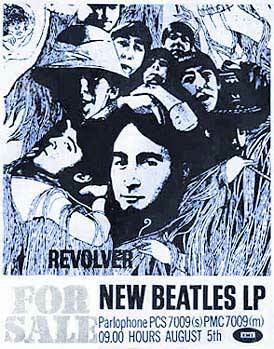 JOHN 1968: "'Tomorrow Never Knows' ...I didn't know what I was saying, and you just find out later. I know that when there are some lyrics I dig, I know that somewhere people will be looking at them." JOHN 1968: "Often the backing I think of early-on never comes off. With 'Tomorrow Never Knows' I'd imagined in my head that in the background you would hear thousands of monks chanting. That was impractical, of course, and we did something different. It was a bit of a drag, and I didn't really like it. I should have tried to get near my original idea, the monks singing. I realize now that was what I wanted." JOHN 1972 "This was my first psychedelic song." JOHN 1980 "That's me in my 'Tibetan Book of the Dead' period. 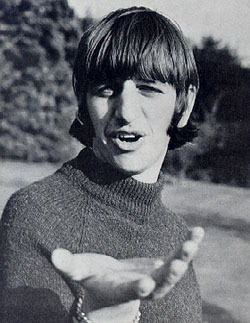 I took one of Ringo's malapropisms as the title, to sort of take the edge off the heavy philosophical lyrics." PAUL 1984: "That was one of Ringo's malapropisms. John wrote the lyrics from Timothy Leary's version of the 'Tibetan Book of the Dead.' It was a kind of Bible for all the psychedelic freaks. that was an LSD song. Probably the only one. People always thought 'Lucy in the Sky with Diamonds' was but it actually 'wasn't' meant to say LSD." JOHN 1972: "Paul. I think I might have helped with some of the lyrics, Yes, I did. But it was mainly Paul's tune." JOHN 1980: "'Paperback Writer' is son of 'Day Tripper' ...meaning a rock 'n roll song with a guitar lick on a fuzzy loud guitar." PAUL circa-1994: "I arrived at Weybridge and told John I had this idea of trying to write off to a publishers to become a paperback writer, and I said, 'I think it should be written like a letter.' I took a bit of paper out and I said it should be something like, 'Dear Sir or Madam, as the case may be...' and I proceeded to write it just like a letter in front of him, occasionally rhyming it... And then we went upstairs and put the melody to it. John and I sat down and finished it all up, but it was tilted towards me-- the original idea was mine. I had no music, but it's just a little bluesy song, not alot of melody. Then I had the idea to do the harmonies, and we arranged that in the studio." JOHN 1966: "After we'd done the session on that particular song-- it ended at about four or five in the morning-- I went home with a tape to see what else you could do with it. And I was sort of very tired, you know, not knowing what I was doing, and I just happened to put it on my own tape recorder and it came out backwards. And I liked it better. So that's how it happened." JOHN 1980: "That's me again-- with the first backwards tape on record anywhere... I got home from the studio and I was stoned out of my mind on marijuana... and, as I usually do, I listened to what I'd recorded that day. Somehow it got on backwards and I sat there, transfixed, with the earphones on, with a big hash joint. I ran in the next day and said, 'I know what to do with it, I know... listen to this!' So I made them all play it backwards. The fade is me actually singing backwards with the guitars going backwards. (sings) 'Sharethsmnowthsmeanss!' That one was the gift of God... of Ja actually-- the god of marijuana, right? So Ja gave me that one." RINGO 1984: "My favorite piece of me is what I did on 'Rain.' I think I just played amazing. I was into the snare and hi-hat. I think it was the first time I used the trick of starting a break by hitting the hi-hat first instead of going directly to a drum off the hi-hat. I think it's the best out of all the records I've ever made. 'Rain' blows me away. It's out in left field. I know me and I know my playing... and then there's 'Rain.'" PAUL circa-1994: "It was nice. I really enjoyed that one." GEORGE: "We spend more time on recording now, because we prefer recording." JOHN: "And we've done half an LP in the time we'd take to do a whole LP and a couple of singles. So we can't do it all, you know, but we like recording." BRIAN MATTHEW: "Alright. When is it going to be finished?" GEORGE: "It should be finished in about two or three weeks time... because if it's not, we'll never be able to get another holiday in before we go away again, you see." PAUL: (joking) "If we don't get it done soon, gov, we'll lose our jobs." JOHN 1966: "Sometimes they say, 'Now you must write,' and now we write. But it doesn't come some days. We sit there for days just talking to each other, messing 'round not doing anything." GEORGE 1966: "John and Paul's standard of writing has bettered over the years, so it's very hard for me to come straight to the top, on par with them. They gave me an awful lot of encouragement. Their reaction has been very good. If it hadn't, I think I would have just crawled away." PAUL 1966: "I don't know whether poets think they have to experience things to write about them, but I can tell you our songs are nearly all imagination-- ninety percent imagination. I don't think Beethoven was in a really wicked mood all the time." JOHN 1966: "It's too easy to put it off if we just meet without any plan and say, 'Shall we write something today?' If you do that then you feel as though you're losing a free day. What we're going to do is make dates beforehand and sort of say, 'Right, Wednesday and Friday of this week are for songwriting. And Tuesday, Wednesday and Thursday of next week.' Then we'll know it's something we've to keep to." JOHN 1966: "One thing's for sure-- the next LP is going to be very different." PAUL 1966: "I don't think we ever try to establish trends. We try to keep moving forward and do something different... and if in the meantime it starts a trend, that's ok. But we never try consciously to start them." 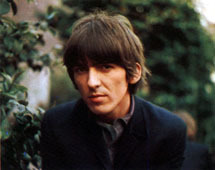 GEORGE 1966: "We all put alot of suggestions in after we've recorded a take. That's why we take so long to record a number. We've always cooperated with one another. Paul might come into the studio and say, 'Do this' if he has worked out the chords beforehand. But they always need changing." 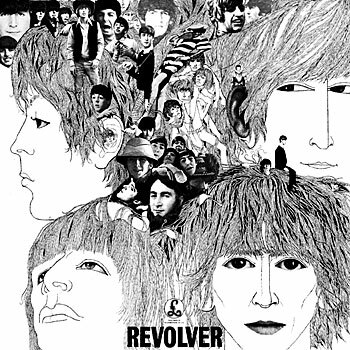 JOHN 1972: "We'd had acid on Revolver. Everybody is under this illusion-- even George Martin was saying, 'Pepper was their first acid album.' But we'd had acid, including Paul, by the time Revolver was finished." PAUL 1988: "George Martin would be saying, 'Can you turn the (guitar) amps down please? And John would look at George (Harrison) and say, 'How much are you going down? Let's go down to Five, alright?' John would go down to Six-- 'OK, I'm at Five!' 'You bugger! You're not. You're at Six!' There was always this terrible rivalry. You just wanted to be louder. But it's nice to listen to the Beatle records now. There's more guitar than you'll ever hear on a record these days."